Ex vivo whole-organ imaging is a rapid method for determining the relative concentrations of fluorescently labeled compounds within and between tissues or treatment groups. Conversely, quantitative fluorescence histology, while more labor intensive, allows for the quantification of the absolute tissue levels of labeled molecules. McGowan, J. W., Bidwell, III, G. L. The Use of Ex Vivo Whole-organ Imaging and Quantitative Tissue Histology to Determine the Bio-distribution of Fluorescently Labeled Molecules. J. Vis. Exp. (118), e54987, doi:10.3791/54987 (2016). Fluorescent labeling is a well-established process for examining the fate of labeled molecules under a variety of experimental conditions both in vitro and in vivo. Fluorescent probes are particularly useful in determining the bio-distribution of administered large molecules, where the addition of a small-molecule fluorescent label is unlikely to affect the kinetics or bio-distribution of the compound. A variety of methods exist to examine bio-distribution that vary significantly in the amount of effort required and whether the resulting measurements are fully quantitative, but using multiple methods in conjunction can provide a rapid and effective system for analyzing bio-distributions. Ex vivo whole-organ imaging is a method that can be used to quickly compare the relative concentrations of fluorescent molecules within tissues and between multiple types of tissues or treatment groups. Using an imaging platform designed for live-animal or whole-organ imaging, fluorescence within intact tissues can be determined without further processing, saving time and labor while providing an accurate picture of the overall bio-distribution. This process is ideal in experiments attempting to determine the tissue specificity of a compound or for the comparison of multiple different compounds. Quantitative tissue histology on the other hand requires extensive further processing of tissues in order to create a quantitative measure of the labeled compounds. To accurately assess bio-distribution, all tissues of interest must be sliced, scanned, and analyzed relative to standard curves in order to make comparisons between tissues or groups. Quantitative tissue histology is the gold standard for determining absolute compound concentrations within tissues. Here, we describe how both methods can be used together effectively to assess the ability of different administration methods and compound modifications to target and deliver fluorescently labeled molecules to the central nervous system1. Fluorescent labeling is an easily utilized and effective method for determining the bio-distribution of compounds, using a range of equipment that is common to many laboratories. Fluorophores are widely available, relatively inexpensive, and come in a variety of wavelengths, such that multiple labeled molecules can be used simultaneously without interference. Most fluorophores have a range of chemistries for conjugation to different reactive groups on target compounds, and the process of conjugation is generally straightforward for most types of reactive sites. Additionally, the equipment required for the measurements of fluorescently labeled compounds are common in many labs. Fluorescent microscopes, imagers, and slide scanners can all be used in different circumstances, making the use of fluorescent labeling highly accessible. Fluorescent labels are frequently used to determine the bio-distribution and kinetics of compounds both in vivo and ex vivo with live imaging devices, such as the IVIS Spectrum Imager, and by quantitative tissue histology2,3. The use of ex vivo whole-organ imaging using live-imaging devices has increased over time due to their ease of use and ability to quickly create an accurate comparison of the relative concentrations of labeled compounds without requiring the further processing of tissues4. However, while ex vivo whole-organ imaging can allow for easy analysis and comparison, it does not generate a quantitative measure of absolute compound concentrations within a tissue. This is due to light scattering effects within intact organs. Since light scattering (and, to a lesser extent, absorbance) varies by tissue size and density, whole-organ imaging can underestimate tissue levels in large or dense organs. Formulating appropriate standards for absolute concentration measurements is also difficult because one must mimic the thickness and density of each individual organ. On the other hand, whole-organ imaging is a rapid method of obtaining the relative tissue levels of an agent, and it is ideal for comparing the relative bio-distribution of multiple related molecules (such as in drug targeting studies). An alternative strategy is to utilize quantitative fluorescence histology, a technique derived from the method of quantitative autoradiography, to obtain absolute tissue levels of a test agent5,6. Rather than placing an entire animal or organ into an imagining device, quantitative tissue histology requires that each tissue be sliced, mounted on slides, scanned, and analyzed individually. Standards of the test agent are prepared and sliced at the same thickness as the organ samples. 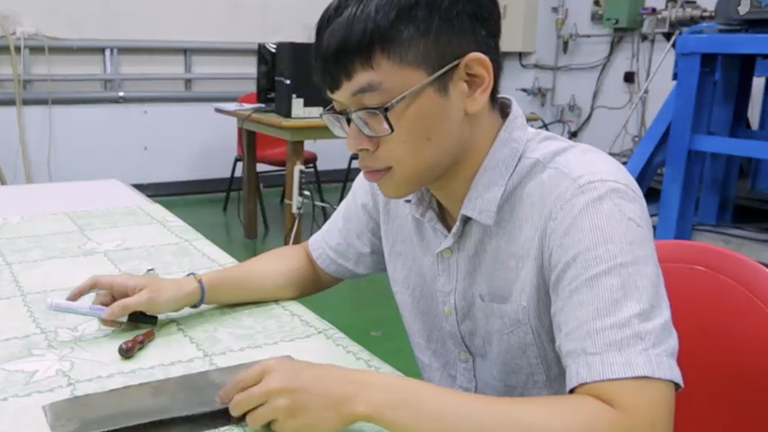 By cutting all organs and standards to the same thickness, variability due to light scattering or absorbance is eliminated, and tissue fluorescence intensity can be fit to the standard curve to determine absolute concentration. While this method, when done properly, is quantitative, it is also labor-intensive and easily mishandled. Given the more complex nature of quantitative histology and the significantly higher cost of labor when compared to whole-organ imaging, it becomes worthwhile to examine where each process is most practical to use when examining the bio-distribution of fluorescently labeled compounds. This protocol provides a detailed description of how these methods can be used together to efficiently compare the bio-distribution of rhodamine-labeled Elastin-like polypeptide (ELP), with or without the addition of the SynB1 or Tat cell-penetrating peptides, via the intranasal (IN) and intravenous (IV) administration routes. NOTE: All animal use in this protocol was approved by the Institutional Animal Care and Use Committee of the University of Mississippi Medical Center. Anesthetize the animals using 3% isoflurane for 5 min and verify the depth of anesthesia by observing the absence of the toe-pinch reflex. Apply veterinary ointment to the eyes to prevent dryness while under anesthesia. Weigh the animal and pipette a 50 mg/kg dose of either rhodamine-labeled ELP, SynB1-ELP, or Tat-ELP into a 1.5-mL tube. Save 100 µL of the administered labeled compounds for formulation of standard curves in later steps. Note: It is important that standards be made from the same batch of labeled protein administered to the animals in order to avoid differences due to variability in fluorescent labeling efficiency. In order to properly remove background fluorescence from later fluorescence measurements, an untreated animal must be sacrificed using the same methods/reagents as the treated animals. Administer an IV injection as previously described1 using either the tail vein or the femoral vein (which is accessed via a 1-cm incision in the groin). For analgesia, if making a groin incision, administer carprofen subcutaneously at a dose of 5 mg/kg, and apply sensorcaine to the incision site before closure with a wound clip. To administer via the intranasal (IN) route, place the animal in the supine position. Using a 2-µL pipette, draw up a 1-µL drop of labeled compound. Briefly slide the animal’s head from the anesthesia collar to allow access to the nares. Place the tip of the pipette to the opening of a single nare and slowly depress the plunger, allowing the droplet to run down the nare into the nasal cavity. Repeat every 1 min, alternating nares every drop until the full dose is administered. Note: The maximum volume administered via IN should not exceed 10 - 15 µL for mice. Leave the animals in the supine position under anesthesia for 10 min after the final administration before moving them each into an individual cage. Note: Do not leave animals unattended until they have regained sufficient consciousness to maintain sternal recumbency. 1 h after administration, re-anesthetize the animals as before and sacrifice them via transcardial perfusion using PBS (210.0 mg/L KH2PO4, 9,000.0 mg/L NaCl, 726 mg/L Na2HPO4.7H2O) at 10 mL/min for a total of 20 mL. Note: the perfusion of the animals at sacrifice to remove all blood from the tissues is required to determine the extravascular concentrations of the labeled compounds. Perfusion reagents can result in changes to background fluorescence and should be kept consistent. The method of sacrifice should be consistent within groups. Different methods of sacrifice can result in varying levels of blood within the vasculature, changing the background fluorescence of the tissues. Prepare PBS as described above for rinsing the removed tissues. Note: If another buffer was used as the perfusion liquid, rinse tissues in the same buffer. Remove the heart, lungs, stomach, liver, spleen, and kidneys by simple dissection. Briefly rinse in PBS before using lab wipes to pat dry or wick away excess moisture and placing the tissues onto the imaging mat. Decapitate the mouse and remove the top of the skull using bone cutters or rongeurs. Using forceps, carefully remove the brain, keeping the olfactory bulbs intact. Rinse, dry, and place it on the provided imaging mat. To remove the spinal cord via rapid ejection7, fill a 10-mL syringe with PBS and attach a dulled 18-gauge needle. Note: 18 gauge fits the adult spinal canal of many mouse lines. The required diameter will vary with animal size. Place the animal in the prone position, ensuring that the opening of the spinal canal at the decapitation site is cleanly cut and free of blood. Remove the skin from around the spinal column. Using sharp bone cutters or scissors, cut through the spinal column in the lumbar section directly rostral to the hips. Briefly rinse it with PBS to visualize the spinal canal. Gently insert the needle into the spinal canal. Note: The needle should feel snug and may require some slow rolling back and forth during insertion. Should the needle feel loose, a more rostral cut can be made or a larger diameter needle might be needed. Using the thumb and index finger, apply pressure to the spinal column around the inserted needle. Depress the plunger with moderate and constant pressure. The spinal cord will eject intact out of the rostral opening in the spinal column. Note: The complete removal, rinsing, and drying of all major organs can be reasonably completed in 5 - 7 min. This short time prevents the need for extended storage in PBS, which could result in excessive exposure to light and the leaching of labeled proteins from the tissue. Under “binning,” select “small” and set the F/Stop to 2. Select the 535-nm excitation and 580-nm emission filters. Note: This will vary depending on the label used. Select “Field of View B” and set the target height to 0.3 cm. Note: This will vary depending on the tissues to be imaged. Once the temperature indicator turns green (meaning the machine is fully initialized), place the tissues onto the provided black background mat, ensuring that the tissues are completely separated from one another. Place the mat in the imager, ensuring that all tissues are within the selected area grid. Larger and non-homogenous tissues, such as the whole liver, should be laid out so as to reduce overlap of the lobes. Note: Tissues can be arranged together in a single group, allowing one image to accommodate a single animal or all tissues of a similar type. This makes analysis and organization easier later on. If large differences in fluorescence intensity are present among various tissues, it is best to image them individually or as groups of the same tissue type, as a single exposure time may not be ideal for all tissue intensities. After imaging, remove the tissues immediately and store or freeze them for quantitative histology, as outlined in step 4. In PBS, create two-fold serial dilutions of each protein used in the treatment of the animals, starting at the original concentration, with a total of 15 dilutions. Note: The concentration range should aim to include the expected tissue concentrations and may require additional dilutions of the original sample, depending on the starting concentration. Pipette 100 µL of each standard into each well of a black 96-well plate. Include one well of pure PBS to obtain a measure of background fluorescence. Image the standards with the same parameters used for the tissue imaging. Subtract the value in average radiant efficiency of the pure PBS from the values of the other standards; this removes the background fluorescence. Plot the values against the known concentration on a scatter plot. Note: The resulting equation of the linear trend line can then be used to calculate the relative fluorescence value. With the resulting average radiant efficiency measurements, subtract the values measured from the untreated animal for each tissue type and plot those values on the previously created standard curve. Note: The resulting relative fluorescence values provide a quick and accurate snapshot of the biodistribution of the labeled compound. Create or purchase containers of sufficient size to freeze the chosen tissues and cryostat to be used. Wrapping aluminum foil around an appropriately sized and shaped object works well. Prepare a mixture of isopropanol and dry ice by filling half of a 500-mL beaker with dry ice and adding ~ 350 mL of isopropanol so that there is sufficient liquid above the dry ice to partially submerge the freezing container. Note: Liquid nitrogen often results in the fracture of the optimal cutting temperature compound (OCT), and embedded tissues and should be avoided. Fill the freezing container partially with OCT, ensuring that there are no bubbles present. If there are bubbles, work the bubbles out of solution using forceps or a similar implement. Remove the tissue from PBS and dry it thoroughly, either by gently patting it with a lab wipe or by touching the edges of delicate tissues to a lab wipe and allowing the liquid to wick away. Place the tissue gently into the OCT inside the freezing container, ensuring not to introduce bubbles underneath the tissue. Once the tissue is in place, add OCT until the tissue is completely covered. Submerge the freezing container as much as is possible without allowing the isopropanol to come in contact with the exposed OCT inside the container. Allow 30 - 90 s (or potentially more for larger tissues) for the OCT and tissue to freeze completely before storing at -80 °C for as long as needed. Preparation of Standards for Slicing. Prepare and appropriately label 1-mL single-use syringes by removing the end of the barrel, such that the entire length of the syringe is one diameter. This will allow the frozen cylinder to be pushed out later. Using OCT, create a 15-step two-fold serial dilution of administered compounds, as was done with PBS previously, but with a final resulting volume of 1 mL. Include one sample of pure OCT for removal of background fluorescence values. The viscosity of OCT makes adequate mixing difficult. Invert the tubes and allow the OCT to completely settle before inverting again. Repeat this 10 - 20 times to ensure a uniform mixture. Keep the standard solutions at 4 °C and away from light during mixing. After mixing, again prepare a mixture of isopropanol and dry ice, as before. Note: Liquid nitrogen can also be used in place of the isopropanol/dry ice mixture, provided the syringes are quickly removed after they have frozen solid. Draw the OCT standard into the syringe, taking care to introduce as few bubbles as possible. After drawing up the OCT solution, immediately dip the syringe directly into the isopropanol and allow the solution to freeze completely inside the syringe for 10 - 20 s. Store the syringes at -80 °C for as long as necessary. Place both tissues and standards in -20 °C and allow enough time for all samples to come to temperature. Note: The ideal cutting temperature generally falls around the -10 °C range for most tissues, but it ultimately depends on tissue size and fat content and must be refined empirically. Using a cryostat, cut tissues into 20-µm thick slices and mount them onto slides, as previously described8. Store the slides at -20 °C and keep them away from light as much as possible during cutting and until scanning. Note: It is important here that the sections to be measured are appropriately distributed throughout the entire thickness of the tissue. To mount the standards onto the cryostat chuck, take the syringe from the freezer and warm the outside for 3 - 5 s by holding it in hand. Push the plunger until a short section (~ 1 cm) of the OCT cylinder is outside of the syringe. Using a razorblade, cut through the cylinder and place the resulting cylinder section perpendicularly onto the chuck, using OCT to hold it in place. This configuration should result in well-defined circles being cut. Slice the cylinders at 20 µm, placing one slice from each dilution onto a single slide, so that one slide represents the entire standard curve. Store the slides at -20 °C until ready for scanning. Start the scan array software and click “543 laser” to begin the laser startup procedure. Wait for 15 min for the laser to get ready. Once the laser is ready, remove the slides from -20 °C and move them into a large, light-protected container to come to temperature and to dry for 3 min. This will prevent moisture buildup in the slide scanner. Set the scan resolution to 50 µm. Select the first “Use” checkbox under “Fluorophore” and select “TRITC.” Set the PMT Gain to 80%. Note: These settings will vary depending on the fluorophore and the concentration of the labeled molecules. After scanning, select “file” and “save as,” and then save the image as a .tif. Note: Slides of tissues and standards should be scanned on the same settings. Note: As with the previous technique, background fluorescence must be subtracted from all measured values. Plot the mean grey value measurements from the standards against the known concentration to create a standard curve. Note: The resulting measurements from the tissues should be averaged within each tissue and plotted on that standard curve to determine the concentration within the tissue. The data below describe the delivery of three compounds: a drug-delivery vector known as ELP and two versions of ELP modified with cell-penetrating peptides (SynB1-ELP and Tat-ELP)9. All three compounds were labeled with tetramethylrhodamine-5-maleimide and delivered via two administration routes (IN and IV). The goal of these experiments was to determine which compound and administration route would result in the best penetration into the central nervous system (CNS)3. Figure 1A displays representative ex vivo whole-organ images of the organs from the treated animals. The heat map overlay shows the fluorescence levels in radiant efficiency within the tissues. By drawing ROIs around the individual tissues and by plotting those values on their corresponding standard curve, standardized fluorescence values illustrated in Figure 1B are generated. The standardized fluorescence values can then be used for accurate comparisons of the relative concentrations of the different compounds. These data accurately describe both the effect of ELP modification on the penetration into specific tissues, as well as the effect of administration route on each compound. With these results, it is immediately clear that ELP delivery via IN administration is the most effective combination to reach the CNS. While these results help determine the best penetrating compound and delivery method, they do not describe the actual concentration or regional localization of compounds within the CNS. Quantitative histology is therefore ideal to complete the description of the bio-distribution of these compounds, as it allows for quantitative measurements of the selected brain regions. 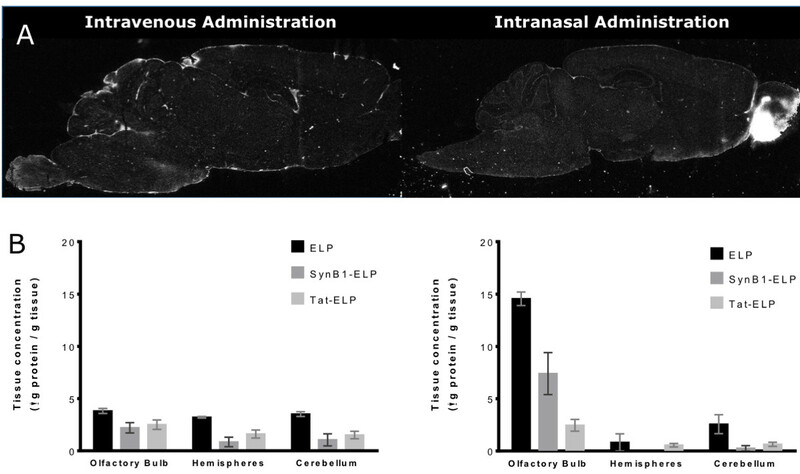 Figure 2A displays a representative slice from the ELP IN-treated animals, and Figure 2B describes the quantification of the ROIs separating the olfactory bulbs, hemispheres, and cerebellum. From these data, it is clear that while ELP administration by the IN route may result in high CNS concentrations, it does this primarily in the olfactory bulbs and cerebellum. Conversely, ELP delivered IV has lower overall concentrations, but it is equally distributed throughout the brain. Depending on the target of these administered compounds and the potential for effects in other organs, either IN or IV administration may be the better choice. This could not be concluded without the addition of the quantitative histology. Technically, quantitative histology could have been used in every tissue of every group, but by utilizing both methods together, a great deal of time and labor was saved while still resulting in the same conclusion. Figure 1: Ex Vivo Whole-organ Fluorescence Measurements. A) Representative images from the ELP group. The heat map scale was set as radiant efficiency. B) Average radiant efficiency values obtained from the creation of ROIs around the individual tissues that were analyzed on a standard curve in order to generate the standardized fluorescence values used for the comparison of bio-distributions. Error bars represent SEM. Scale bar = 5 mm. (Modified from McGowan, et al. ; Drug Design, Development, and Therapy; 2016) Please click here to view a larger version of this figure. Figure 2: Quantitative Tissue Histology Measurements. A) Representative image of ELP IN- or IV-treated animals created by slicing brains 20 μm thick, mounting the slices on slides, and then scanning those slides using a fluorescence slide scanner. B) Average values obtained from the creation of ROIs around the olfactory bulb, hemispheres, and cerebellum, measured as the mean grey value and fit to a standard curve to generate μg/mL concentration measurements. Error bars represent SEM. Scale bar = 5 mm. (Modified from McGowan, et al. ; Drug Design, Development, and Therapy; 2016) Please click here to view a larger version of this figure. While ex vivo whole-organ imaging is generally straightforward, the adherence to some basic concepts and techniques can improve the accuracy of bio-distribution measurements. Short wavelengths of light experience a high degree of scattering and absorbance in most tissues, which significantly impacts the utility of the short-wavelength fluorophores. These fluorophores have limited application in deep-tissue studies, but they have been used effectively in experiments looking at surface tissues or into the eye. Conversely, long wavelengths of light undergo significantly less scattering and absorbance, resulting in greater penetration and more accurate results with thicker tissues10. Fluorophores which fall in the far-red and near infrared (NIR) range (excitation ∼ 600 nm) of the spectrum are commonly chosen for whole animals or larger tissues. For experiments using these long-wavelength fluorophores, the auto-fluorescence of particular tissues or materials is likely a key consideration. For example, the bile inside the gallbladder of rodents is highly auto-fluorescent at wavelengths in the 500 - 600 nm range. Because this can greatly skew liver values, it is often best to remove the gallbladder prior to imaging. Alternatively, if the intact liver and gall bladder are required, choosing a fluorophore with an excitation wavelength at the very far end of the spectrum can limit the influence of the bile auto-fluorescence. Additionally, many of the common rodent chows contain unpurified alfalfa, which fluoresces highly throughout the mid- and far-ranges of the spectrum. If the chosen labels fall within those wavelengths and the digestive tract is to be imaged, a change in diet is likely the best option. While live imaging systems are designed to accurately measure thick tissues, with non-homogenous and particularly thick tissues (e.g., whole rat livers), more accurate measurements can often be obtained by spreading the tissue out, such that the lobes of the liver overlap as little as possible. Also, in cases where tissues have a highly skewed distribution of labeled molecules, imaging from multiple sides of the tissue and averaging those measurements may increase accuracy. Ultimately, the types of tissue to be imaged, the auto-fluorescence of the materials associated with those tissues, and the potential distribution of the administered labeled molecules should be carefully considered in order to choose a fluorophore with the appropriate excitation and emission wavelengths that limit interference as much as possible. When performing quantitative tissue histology, there are several important details to keep in mind. In order for the results to be accurate, slices must be taken throughout the whole tissue or region to be analyzed. This means that these tissues will not be available for other processes. It may be possible to fix and stain after scanning, but it is typically best to allow the slices to dry slightly before putting them into the scanner, which could affect future staining. Likewise, the scanning will cause some level of photo-bleaching, reducing the potential signal in subsequent processes. For downstream microscopy applications, superior sections are typically achieved by fixing the tissues and equilibrating them in a sucrose solution prior to sectioning. However, this process is best avoided in the above quantitative histology protocol due to the effects of fixation and/or long sucrose soaks on fluorescence intensity. Also, depending on the amount of signal present, slices may experience photo-bleaching if exposed to even low levels of ambient light. Keeping the slides cold and away from light will significantly improve the accuracy of the resulting measurements. Overall, careful handling and preparation can drastically improve the final outcome. There are a variety of other methods employed for studying the bio-distribution and pharmacokinetics of administered macromolecules that vary widely in technical difficulty, throughput, accuracy, and the equipment required11. Quantitative immunoassays and bioactivity assays can both be technically complicated and require antibodies or reagents specific to the administered molecules, adding significantly to the cost and labor. Multiple methods based on radioisotope labeling have been used in the past, with varying accuracy, but the integration of radioisotopes to macromolecules, as well as the collection of data itself, can require significant preparation and can often render tissues completely unusable for further analyses12. Finally, other methods shown to be effective, including positron emission tomography and mass spectrometry, are typically precluded simply due to a lack of the required equipment. The protocol described above uses two methods in conjunction for efficiently determining the bio-distribution of labeled molecules in a quick, cost-effective, accurate, and easily accessible manner due to the regular availably of the required equipment. This method was used to generate the data above, identifying the best vector and administration route for the delivery of labeled molecules to the CNS. 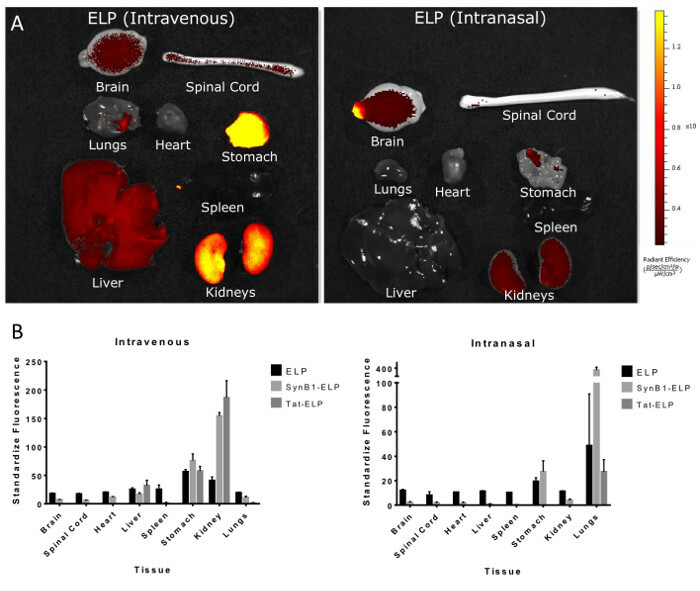 From the ex vivo data, ELP administered IN and ELP administered IV were identified for further characterization via quantitative tissue histology. Quantitative tissue histology then provided the concentrations of labeled molecules in specific regions of the CNS, allowing the final conclusions to be drawn. The two methods together represent a fast and effective way to perform a detailed examination of the bio-distribution of multiple specific compounds. GLB is owner of Leflore Technologies, LLC, a private company working to develop ELP-based drug delivery technology. Leflore Technologies provided no support for the publication of this paper or for the generation of data within it. Partial salary support for GLB is provided by NIH grant R01HL121527. JWDM is supported by the Currier Fellowship in Neurology. George, E. M., Liu, H., Robinson, G. G., Bidwell, G. L. A Polypeptide Drug Carrier for Maternal Delivery and Prevention of Fetal Exposure. J. Drug Target. 22, (9), 1133-1145 (2014). George, E. M., Liu, H., et al. Growth factor purification and delivery systems (PADS) for therapeutic angiogenesis. Vasc. Cell. 7, (1), 1-11 (2015). Bidwell, G. L., Perkins, E., Hughes, J., Khan, M., James, J. R., Raucher &, D. Thermally Targeted Delivery of a c-Myc Inhibitory Polypeptide Inhibits Tumor Progression and Extends Survival in a Rat Glioma Model. PLoS One. 8, (1), (2013). Liu, H., Zhang, W., et al. The improved blood–brain barrier permeability of endomorphin-1 using the cell-penetrating peptide synB3 with three different linkages. Int. J. Pharm. 476, (1-2), 1-8 (2014). Flessner, M. F., Fenstermacher, J. D., Blasberg, R. G., Dedrick, R. L. Peritoneal absorption of macromolecules studied by quantitative autoradiography. Am. J. Physiol. 248, 26-32 (1985). Flessner, M. F., Choi, J., He, Z., Credit, K. Physiological characterization of human ovarian cancer cells in a rat model of intraperitoneal antineoplastic therapy. J Appl Physiol. 97, 1518-1526 (2004). Kennedy, H. S., Jones, C., Caplazi, P., Iii, C. J., Caplazi, P. Comparison of standard laminectomy with an optimized ejection method for the removal of spinal cords from rats and mice. J. Histotechnol. 36, (3), 86-91 (2013). Currle, D. S., Monuki, E. S. E. Flash Freezing and Cryosectioning E12.5 Mouse Brain. J. Vis. Exp. JoVE. (4), e198 (2007). Walker, L., Perkins, E., Kratz, F., Raucher &, D. Cell penetrating peptides fused to a thermally targeted biopolymer drug carrier improve the delivery and antitumor efficacy of an acid-sensitive doxorubicin derivative. Int. J. Pharm. 436, (1-2), 825-832 (2012). Frangioni, J. V. In vivo near-infrared fluorescence imaging. Curr. Opin. Chem. Biol. 7, (5), 626-634 (2003). Vugmeyster, Y. Pharmacokinetics and toxicology of therapeutic proteins: Advances and challenges. World J. Biol. Chem. 3, (4), 73 (2012). Stumpf, W. E. Whole-body and microscopic autoradiography to determine tissue distribution of biopharmaceuticals - Target discoveries with receptor micro-autoradiography engendered new concepts and therapies for vitamin D. Adv. Drug Deliv. Rev. 65, (8), 1086-1097 (2013).